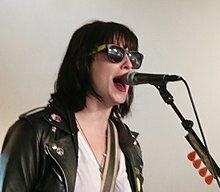 Brody Dalle (born Bree Joanna Alice Robinson; 1 January 1979)  is an Australian-born singer-songwriter and guitarist. Dalle began playing music in her adolescence, and moved to Los Angeles, California at age eighteen, where she founded the punk rock band The Distillers. The group released three albums before disbanding in 2006. Dalle began another project, Spinnerette, releasing an eponymous album in 2009. In 2014, she released Diploid Love , her first album under her solo name. The Distillers are an Australian-American punk rock band, formed in Los Angeles, California in 1998 by vocalist and guitarist Brody Dalle. Dalle co-wrote, played guitar and provided vocals for nearly every track on the band's three albums. After the breakup of the band in 2006, Dalle and Distillers guitarist Tony Bevilacqua went on to form Spinnerette. Spinnerette is an alternative rock band formed in 2007. The band consists of Brody Dalle, Tony Bevilacqua, Jack Irons and Alain Johannes. The band has been inactive since 2010 and its future is uncertain. Diploid Love is the debut solo album by Brody Dalle, former frontwoman of The Distillers and Spinnerette. The digital download was released on April 28, 2014 in the United States and April 29 in Canada, followed by the CD and vinyl record set on May 19. The lead single, "Meet the Foetus/Oh the Joy", was streamed for free on Soundcloud on February 9 before being released to iTunes on February 17. Northcote is an inner suburb of Melbourne, Victoria, Australia, 6 km north-east of Melbourne's Central Business District. It is part of the local government area of the City of Darebin. At the 2016 Census, Northcote had a population of 24,561. Swimming has been a sport at every modern Summer Olympics. It has been open to women since 1912. Along with track & field athletics and gymnastics, it is one of the most popular spectator sports at the Games. Swimming has the second largest number of events. Dalle was intrigued by Cyndi Lauper and the Beatles as a child. At age 12, she discovered Nirvana,  and cited Courtney Love and her band Hole, as well as other female-led punk groups such as Babes in Toyland and Bikini Kill, as early influences on her. Dalle's musical career began at 13 years old, starting with guitar. She participated in Rock 'n' Roll High School (RnRHS), a Melbourne feminist collective started by Stephanie Bourke. She became interested in Black Flag, Discharge, and Flipper. In 1995 at 16, her first band, Sourpuss, played a set at Australia's Summersault Festival where she met Tim Armstrong, frontman of punk rock band Rancid. The two pursued a relationship despite Dalle being underage. The couple were engaged in 1997, shortly after Dalle turned 18. She moved with Armstrong from Melbourne to Los Angeles and there founded The Distillers. The Beatles were an English rock band formed in Liverpool in 1960. With members John Lennon, Paul McCartney, George Harrison and Ringo Starr, they became regarded as the foremost and most influential band in history. Rooted in skiffle, beat and 1950s rock and roll, the group were integral to pop music's evolution into an art form and to the development of the counterculture of the 1960s. They often incorporated classical elements, older pop forms and unconventional recording techniques in innovative ways, and later experimented with several musical styles ranging from pop ballads and Indian music to psychedelia and hard rock. As the members continued to draw influences from a variety of cultural sources, their musical and lyrical sophistication grew, and they were seen as an embodiment of the era's sociocultural movements. The Distillers released their eponymous debut album in 2000, receiving acclaim and comparisons to Hole, with Dalle often compared to Courtney Love  and later to PJ Harvey. By the recording of their second album Sing Sing Death House the band had a new line-up and by the time of their third album Coral Fang Dalle was then the only remaining original member. 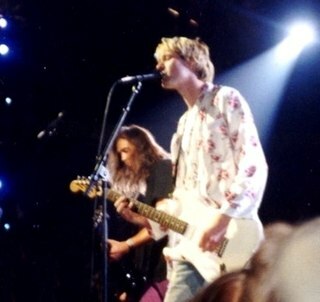 The album was well-received,  and the band experienced success with several singles from the album and performed at Lollapalooza. In 2001 Dalle also made a cameo in New Found Glory's music video My Friends Over You with then-husband Tim Armstrong, as well as Travis Barker and Rob Aston. The Distillers is the debut album by the American punk rock band The Distillers, released in 2000. Courtney Michelle Love is an American singer, songwriter, actress, and visual artist. A notable figure in the punk and grunge scenes of the 1990s, Love's career has spanned four decades. She rose to prominence as the lead vocalist of the alternative rock band Hole, which she formed in 1989. Love has drawn public attention for her uninhibited live performances and confrontational lyrics, as well as her highly publicized personal life following her marriage to Nirvana frontman Kurt Cobain. Alain Johannes Mociulski is a Chilean-American multi-instrumentalist and vocalist, whose primary instruments are guitar and drums. He is a founding member of several bands, including the alternative rock group Eleven, and has been involved with acts such as hard rock band Queens of the Stone Age, Them Crooked Vultures, PJ Harvey, Chris Cornell, Arctic Monkeys, Mark Lanegan and The Desert Sessions, both as a musician and as a producer. 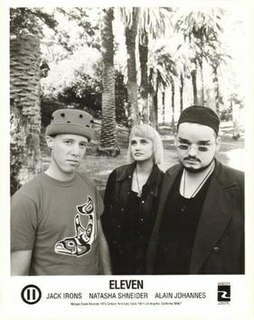 Eleven was an alternative rock band from Los Angeles, California, formed in 1990 by Alain Johannes, Natasha Shneider, and Jack Irons (drums). Dalle has also played on tracks for the band Eagles of Death Metal under various monikers and appeared on the song "Weigh on My Mind" on the Transplants' debut album in 2002. She has also made vocal appearances on Queens of the Stone Age's "You Got a Killer Scene There, Man" on their 2005 album Lullabies to Paralyze and also an appearance on Leftöver Crack's song "Muppet N.A.M.B.L.A" from their 2004 album Rock The 40 Oz: Reloaded. In 2009, she made an appearance in the same song as her husband, Josh Homme, on "Bargain Healers" from the French artist Nosfell on his self-titled album. In 2011, Brody Dalle was featured on a Boots Electric song called "Boots Electric Theme." At the beginning of 2012, Brody Dalle abandoned her long-term black hair in favour of blonde hair, which is her natural hair color. In November 2012, Dalle announced on Twitter that she was working on a solo album, featuring Alain Johannes and Michael Shuman of Queens of the Stone Age and Shirley Manson of Garbage. In November 2013, Dalle announced that she had signed to Caroline Records, a division of Universal Music Group, with the intention of releasing her debut solo album in early 2014. The album was produced by Alain Johannes, and features guest appearances from Shirley Manson of Garbage, Nick Valensi of the Strokes, and Warpaint's Emily Kokal. Dalle supported Nine Inch Nails and Queens of the Stone Age on their Australia/New Zealand tour in March 2014 to promote the album. In February 2014, Dalle released the first single from her debut solo album, Diploid Love , called "Meet The Foetus / Oh The Joy" featuring backing vocals by Shirley Manson of Garbage and Emily Kokal of Warpaint. The second single from the album, "Don't Mess With Me," was used in the soundtrack of the Square Enix game Life is Strange: Before the Storm. Diploid Love was released on 28 April 2014. Upon becoming pregnant with her third child in 2015, Dalle entered a musical hiatus. In January 2018, Dalle shared links from her Twitter account to a newly-made Twitter account for The Distillers, as well as a previously-established/archival Instagram account for the band. A teaser video was put up across all platforms, confirming the return of the band. According to the Distillers' Twitter account, the four accounts it follows make up the 2018 line-up: Dalle, guitarist Tony Bevilacqua, drummer Andy Granelli and Dalle's former Spinnerette bandmate Alain Johannes on bass. After her divorce, Dalle reverted to using the surname of her favourite actress, Béatrice Dalle, best known for Betty Blue . Timothy Ross Armstrong is an American musician, singer, songwriter, producer, and actor. He is best known as the singer/guitarist for the punk rock band Rancid and hip hop/punk rock supergroup Transplants. Prior to forming Rancid, Armstrong was in the influential ska punk band Operation Ivy. In 1997, along with Brett Gurewitz of the band Bad Religion and owner of Epitaph Records, Armstrong founded Hellcat Records. In 2012, through his website, Armstrong started releasing music that influenced him, along with stripped-down cover songs of his own work under the name Tim Timebomb. He has released at least one song per week since late 2012. Armstrong is also a songwriter for other artists. Armstrong won a Grammy Award for his work with Jimmy Cliff and Pink, and has also worked with Joe Walsh. 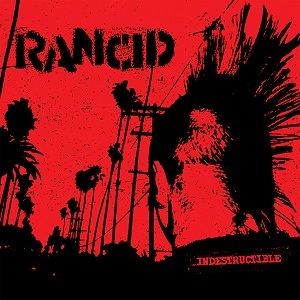 Indestructible is the sixth studio album by the American punk rock band Rancid. It was produced by Brett Gurewitz and released by Hellcat Records with distribution through Warner Bros. Records on August 19, 2003. Despite critical acclaim, the band was criticized by some of its fans for Indestructible's "poppier" sound on some of its tracks. It debuted at number 15 on the charts, with 51,000 copies sold in its first week, making it Rancid's highest debut at the time though it would be surpassed six years later with their 2009 album, Let the Dominoes Fall. Indestructible marks the last recording by drummer Brett Reed, who left the band in 2006 and was replaced by current drummer Branden Steineckert. Peace, Love, Death Metal is the debut studio album by Eagles of Death Metal, released on March 23, 2004. Joshua Michael Homme is an American singer, songwriter, musician, record producer, and actor. He is best known as the founder, primary songwriter, and only continuous member of the rock band Queens of the Stone Age, in which he sings and plays guitar, as well as occasionally playing bass, piano, and drums. Sing Sing Death House is the second studio album by the American punk rock band The Distillers, released in 2002 on Hellcat Records. The song "Seneca Falls" was featured in the game Tony Hawk's Pro Skater 4 and is a reference to the Seneca Falls Convention of 1848. Transplants are an American punk rock/rap rock supergroup. They formed in 1999 when Tim Armstrong played his friend and roadie Rob Aston some beats he had made using Pro Tools and asked Aston if he would consider contributing lyrics. Initially, Armstrong played all the instruments himself, but as the project grew, he invited musician friends such as Matt Freeman (Rancid), Lars Frederiksen (Rancid), and Vic Ruggiero to add to the sound. Before long, Armstrong and Aston decided to officially form a band, but to make things complete, they wanted a drummer, so Travis Barker from Blink-182 was asked to join in 2002. 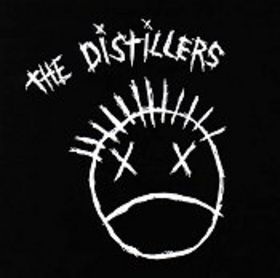 The Distillers is the debut release and first 7" EP released by the Los Angeles, CA punk rock band The Distillers. 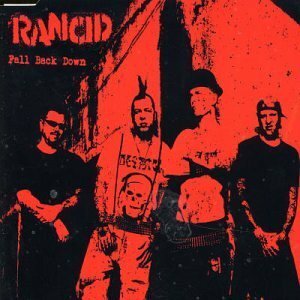 "Fall Back Down" is a song by the American punk rock band Rancid. It was released as the first single from their sixth album, Indestructible. "Fall Back Down" was released to radio on July 22, 2003. It peaked at number 13 on the US Modern Rock Tracks. Michael Jay Shuman, also known as Mikey Shoes, is an American musician and songwriter. He is best known for playing bass with rock band Queens of the Stone Age. He also sings and plays the drums and various other instruments in Mini Mansions, and formerly co-fronted Wires on Fire and Jubilee. Anthony Peter Bevilacqua is an American musician. He is currently guitarist with Spinnerette and was previously a member of The Distillers, appearing on the band's third album and major label debut Coral Fang, which entered the US Billboard Album Top 200 Chart at #96 in October, 2003. He also used the stage name "Tony Bradley" while with The Distillers. The ninth The Desert Sessions LP, Volume 9: I See You Hearin' Me, was released in 2003, packaged along with Volume 10: I Heart Disco in a gatefold 10" album format. "I Wanna Make It wit Chu" was later released on the Queens of the Stone Age album Era Vulgaris under the title "Make It wit Chu". "Covered in Punk's Blood" has also been played by the band at live shows as seen in the live album and video Over the Years and Through the Woods. Homme has since stated that “Dead In Love” and “I Wanna Make It Wit Chu” were written for Brody Dalle "I went back to do those Desert Sessions, and you can tell what I was going through because I was writing stuff like “Dead In Love” and “I Wanna Make It Wit Chu”. I was so in love, I was totally revelling in it so much, I was a little paralysed”. Them Crooked Vultures is a rock supergroup formed in Los Angeles in 2009 by John Paul Jones on bass and keyboards, Dave Grohl on drums and backing vocals, and Josh Homme on guitar and vocals. The group also includes guitarist Alain Johannes during live performances. The band began recording in February 2009, and performed their first gig on August 9, 2009, in Chicago, followed by a European debut on August 19. On October 1 the group embarked on a worldwide tour titled Deserve the Future with dates going into 2010. The band's first single "New Fang" was released in October 2009, followed by the group's self-titled debut album the following month, debuting at number 12 on the Billboard 200. The group won the 2011 Grammy Award for Best Hard Rock Performance for "New Fang". Morgana Robinson is a BAFTA winning Australian-born English comedian, writer and actress, who is best known for her comedy sketch programme The Morgana Show, Morgana Robinson's The Agency, appearances on The TNT Show, House of Fools and Very Important People. "Girls Talk" is a stand-alone single released by alternative rock band Garbage for Record Store Day 2014. Developed from a long gestating song idea, written by the band for inclusion on their 2007 greatest hits set Absolute Garbage, "Girls Talk" features Brody Dalle. Butch Vig described the original sessions for the song as "pretty cool sounding, lots of fast pizzicato guitars and cellos". The newly recorded take of "Girls Talk" features Eric Avery on bass guitar and was engineered and mixed by Billy Bush. 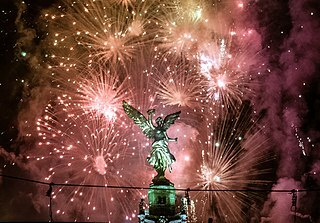 ↑ "Spinnerette | Gratis muziek, tourneedata, foto's, video's". Myspace.com. Retrieved 3 March 2012. ↑ Diehl 2007, p. 92. 1 2 Pinnegar, Shane. "Interview: Brody Dalle - April 2014". 100 Percent Rock. Archived from the original on 18 February 2016. Retrieved 17 October 2015. ↑ "Brody Dalle". Ask Men. Retrieved 17 October 2015. 1 2 3 Andrews, Charlotte Richardson (14 April 2014). "Brody Dalle interview: 'I'm not going to be held down'". The Guardian. Retrieved 17 October 2015. 1 2 Admin (11 November 2009). "Brody Dalle Shares Her Highs And Lows". Clash Music. Retrieved 14 March 2016. 1 2 Sullivan, Caroline (11 March 2004). "Scare tactic". The Guardian. Retrieved 17 October 2015. ↑ Diehl 2007, p. 93. ↑ Diehl 2007, pp. 93-94. 1 2 Diehl 2007, p. 95. ↑ Sullivan, Caroline (11 March 2004). "Scare tactic". The Guardian. Retrieved 25 February 2014. ↑ "Hey Ladies: Pop Stars Vs. Role Models : The Record". NPR. 28 September 2010. Retrieved 3 March 2012. ↑ Aaron, Charles (January 2004). "Revival of the year". Spin: 68. ↑ "Lollapalooza '03". janesaddiction.org. Retrieved 9 February 2016. 1 2 Andrews, Charlotte Richardson (10 April 2014). "Brody Dalle interview: 'I'm not going to be held down'" . Retrieved 8 July 2017– via The Guardian. ↑ ""Brody Dalle Speaks on Spinnerette, Distillers" – ''Spin Magazine Online''". Spin.com. Retrieved 3 March 2012. ↑ Bychawski, Adam (17 November 2013). "Brody Dalle signs to Universal's Caroline company". NME. Retrieved 14 March 2016. ↑ Cooper, Leonie (25 April 2014). "Reviews - Brody Dalle - 'Diploid Love'". NME. Retrieved 12 March 2016. ↑ Breihan, Tom. "The Distillers Are Back". Stereogum.com. Stereogum. Retrieved 4 January 2018. ↑ "Queens of the Stone Age: "You work first, then party later…"". Uncut.co.uk. Spring 2007. Retrieved July 16, 2014. ↑ "Josh Homme in Fight With Tim Armstrong Over Brody Dalle". contactmusic.com. 21 March 2005. Retrieved 8 July 2017. ↑ "Brody Dalle: the return of tough, surly female singers". New Statesman. 13 March 2014. Retrieved 30 April 2014. ↑ Gamp, Joe (17 February 2016). "Josh Homme and Brody Dalle announce birth of third child, Wolf". NME. Retrieved 1 March 2016. Diehl, Matt (2007). My So-Called Punk: Green Day, Fall Out Boy, the Distillers, Bad Religion—How Neo-Punk Stage-Dived into the Mainstream. New York: St. Martin's Griffin.